MYTH: most of the federal government spending is on infrastructure, defense, education and helping the needy. Income taxes are not confiscatory because they benefit everyone. You consent to roads, bridges, waterways, military, research and all the other services government provides to create a more propitious atmosphere for a flourishing society. REALITY: Only 25% of “payments to individuals” of the President’s 2017 budget is allocated towards medicare, housing, food stamps and welfare programs. 2.9 trillion out of a 4.1 trillion dollar budget, is for “payments to individuals.” Basically, the Feds cutting checks to people. A majority of the redistribution (45%) is for programs geared towards the middle class such as: Social Security, student aid, Medicare benefits, federal employee pensions etc. 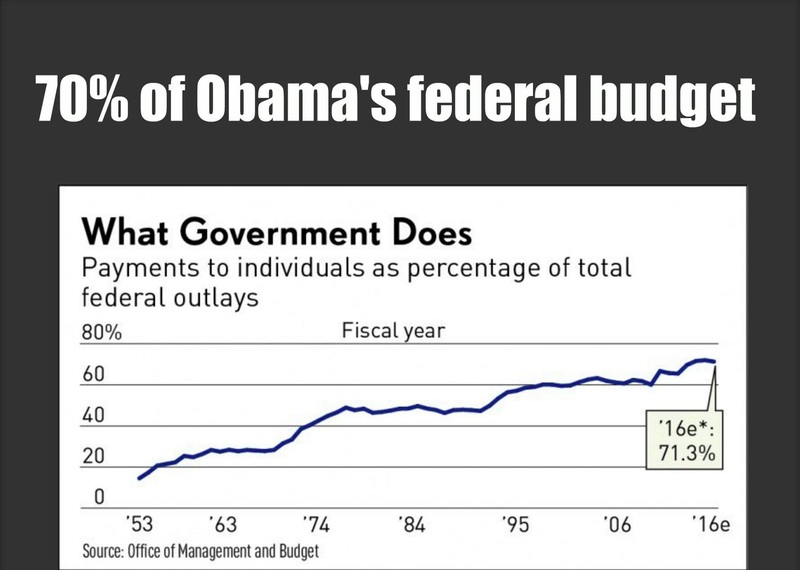 As recently as 1991, payments to individuals were less than 50% of the budget, and when Obama took office, accounted for 60% of the total budget. While “payments to individuals” continue to increase quite rapidly over time, the greatest share of federal income taxes are paid by a smaller group of income earners. According the the IRS the top 5% income earners pay a whopping 58% of total federal income taxes, the top 20% pay an astounding 84%. Compare that to the bottom 50% of income earners that pay only 2.8% of federal income taxes. We have a system that benefits mainly the middle-class at the greatest pecuniary costs to the rich, and only marginally benefit the poor. The majority of money comes out of someone’s pocket (the rich) and directly into someone else’s pocket (mostly, middle class citizens). It’s become increasing clear that the federal government uses the taxing power to redistribute wealth, and create a need for government among America’s largest voting bloc: the middle class. Economist Aaron Director, in the early 1960’s, proposed a law that public expenditures are made primarily for the benefits of the middle classes at the expense of the poor and rich. The middle class being the largest voting bloc, makes them the most powerful, and politicians recognizing this are concerned primarily with their concerns and needs at the expense of others. This is what makes this nearly impossible to change. We now have a system where 80% of the population votes to take directly from the other 20%.